Charlie Appleby was wreathed in smiles as he became the first trainer to provide Godolphin with an Investec Derby victory in their blue colours after Masar stormed to victory. The 16/1 shot was always travelling kindly under jockey William Buick and the pair loomed ominously two furlongs from home, as they challenged leader Hazapour (ridden by Frankie Dettori - 5th) and eventual runner-up Dee Ex Bee (20/1), with the third placed Roaring Lion (6/1) still travelling well behind that trio. Appleby couldn't quite believe the result immediately after the Britain's richest race, worth £1.5-million. "That was absolutely amazing," said Appleby. "All I could think of in the last furlong was that I wanted to be the first trainer to win the Derby in the Godolphin blue. It was a fantastic team effort. Brett Doyle (former jockey) rides him every day and has been so sweet on him since the 2000 Guineas (where Masar finished third behind today's 4/5 favourite Saxon Warrior, who finished 4th). We just wanted to get him to switch off and we thought he'd stay. William's given him a brilliant ride but the last 100 yards seemed a long time! "It's such a special day with the Royal family being here. This season, we've just been knocking on the door and it was the same story yesterday (when 5/2 favourite Wild Illusion was beaten into second in the Investec Oaks). Obviously, I went home a bit disappointed, and it was a long drive home, but that's the great thing about His Highness (Sheikh Mohammed - owner of Godolphin), he told me not to worry and that we'd try next year. "So I came here today very relaxed and just wanted the horse to do his best. It's been so good. It still hasn't sunk in and it probably won't for days or even weeks. I was always just hoping the door was going to open for us this season and, to be honest, I did think it was going to be yesterday. "The great thing about the team around me, especially His Highness Sheikh Mohammed, is that they are so supportive. I'm a realist - I've been in this game all my life and we were beaten fair and square yesterday. You've just got to take it on the chin and take the positives out of it. "Today was another day though. He put up a great performance in the Guineas and it was always going to be the best trial I thought. "I'm very lucky to have been given this position and all I wanted to do when I got it was to win the Derby for the team. Each year, I've watched it go by without having a winner but you've got to keep trying." 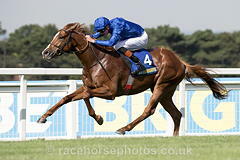 William Buick, on the one and a half-length winner of the premier Classic, 16/1 Masar, said: "It is unbelievable. It hasn't sunk in yet." Silvestre de Sousa, on 20/1 second Dee Ex Bee, said: "We just got beaten by a better one." Oisin Murphy, on the 6/1 third Roaring Lion, said: "He relaxed well and travelled through the race nicely. I felt he could win at the bottom of the straight but he didn't stay a mile and a half oh this ground." Ryan Moore, on the 4/5 favourite and fourth placed Saxon Warrior, said: "It is disappointing. I don't think he was running well. I don't know if it was the track or the ground." Frankie Dettori, on the fifth home Hazapour (12/1), said: "I had a lovely trip, sat in third but he didn't get home." Seamie Heffernan, on sixth Delano Roosevelt (16/1), said: "Not good enough." James Doyle, on seventh Young Rascal, said: "It was very disappointing, I couldn't really get into the race from our draw." Wayne Lordan, on eighth The Pentagon (33/1), said: "I got a nice position and travelled well but just felt the ground a little bit too slow for him." Donnacha O'Brien, on ninth Kew Gardens (16/1), said: "I got a grand trip round, he just wants further." Robert Havlin, on 10th Sevenna Star (50/1), said: "I jumped quite well but he didn't really have the speed to hold his position. I got roughed up a little bit going up the hill so we ended up further back than we wanted. We then travelled OK but fell down the hill. He is a big horse." Richard Kingscote, on 11th Knight To Behold (14/1), said: "I thought he just didn't really enjoy the track, especially on the downhill run"
Padraig Beggy, on 12th Zabriskie (66/1), said: "He just didn't handle the track."